Fiber Connect of the Berkshires is dedicated to providing its subscribers with safe, reliable service. On occasions when you experience disruption with your broadband service, please check here for the area affected and the restoration of service. Fiber Connect is aware of spotty service outages occurring in Egremont and Monterey. We are working through the issues and will keep all subscribers updated as to their resolution. When resolved we will be best able to provide an explanation for these outages. Please be patient and do not re-boot your ONT. We apologize for the service disruptions and appreciate everyone’s understanding. Update: The problem has been isolated and a solution is being implemented. On Monday damaging winds developed over western New England. Winds in excess of 50 mph were common across areas of Egremont and Monterey. As a result numerous power outages and downed trees occurred across our network. 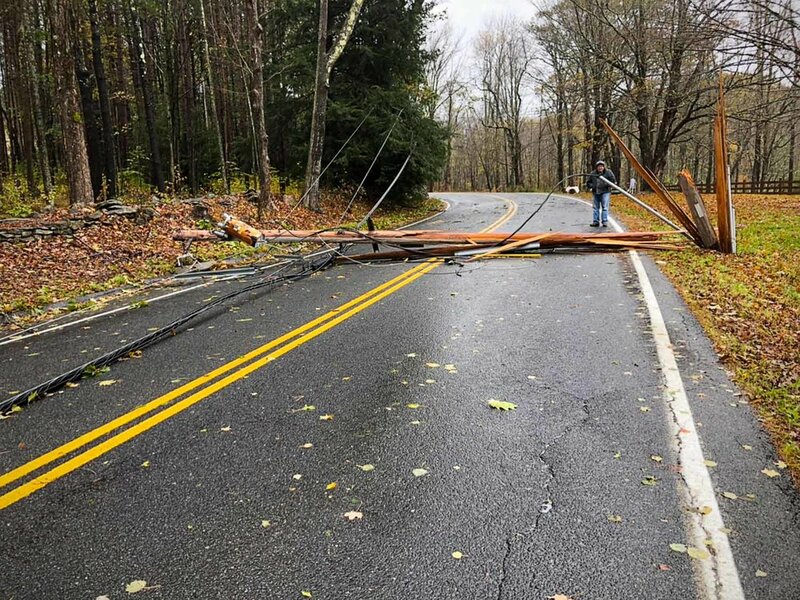 Although Fiber Connect’s network suffered no major outages, several cables were in need of reattachment where poles were damaged and two customers had on-property cables severed due to fallen trees. One of the hardest hit areas was Shun Toll and Rt. 71. The top of the pole carrying electrical wires to North Egremont premises South, East and West of Rowe Rd was sheared off by a large tree fallen by strong winds, closing Rt. 71 between Rowe and Boice. 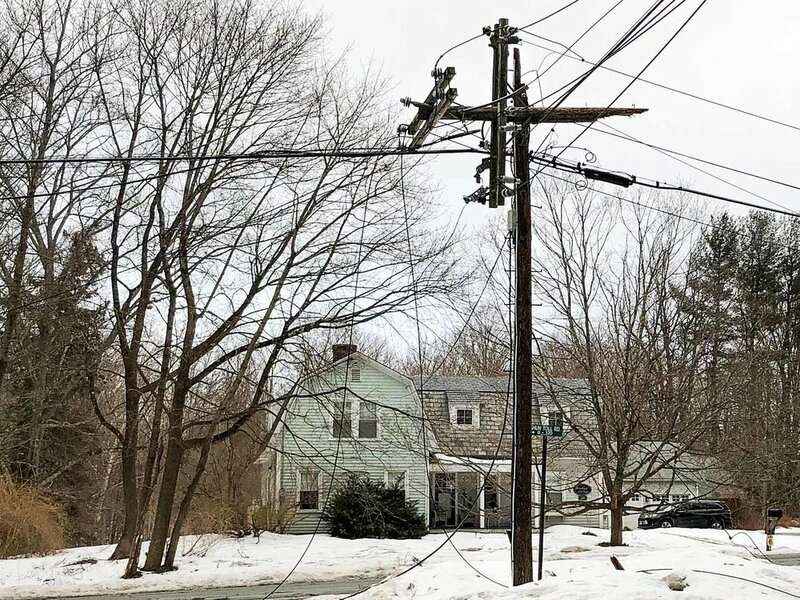 It took National Grid crews from midday Monday to Tuesday end-of-day to install a new pole and reattach electrical wires. Our crew was there waiting for clearance to reattach our intact fiber cable and enclosure. No interruption of service occurred. Click here to watch a video of the incident. 10/27/2018 North of Hupi Rd, Monterey. Multiple Poles Down. High winds in the afternoon felled two trees taking out poles and causing power outages north of Hupi Rd. In both instances our fiber survived intact. In one of the instances, the felled tree ripped out 4 poles of electric and one pole snapped and shattered. Fiber Connect subscribers who have Uninterruptible Power Supply units attached to their ONT’s will be able to stay online. Once National Grid completes its repairs and it’s safe for our crew, we’ll lift our fiber onto the new pole. Incident fully resolved by Sunday, Oct. 28, 2018. Around 4:30 PM, Fiber Connect became aware of a network-wide issue that caused the network to go down. The outage was caused by a hardware failure at our upstream carriers in Springfield, MA. Our network as well as several other provider networks in Western Massachusetts were affected. The issue was never on our network. We notified all subscribers via email when the outage was first detected plus sent an additional email when more information was available from our carrier. Throughout the outage we remained in constant touch with the carrier's technicians providing help with resolving the hardware failure. At approximately 4:18 AM the next morning, we started to see traffic passing from our network to our carrier. Although this issue was out of our physical network footprint, we felt an apology was owed to our subscribers for this interruption to their service. We have begun our own evaluation of what occurred and will undertake steps to avoid a similar situation in the future. 3/23/2018 Baldwin Hill East, Egremont. Pole Down. In the early morning, a car hit a pole to avoid striking a deer. A Fiber Connect crew working in the area was able to arrive at the scene with the police and emergency vehicles. 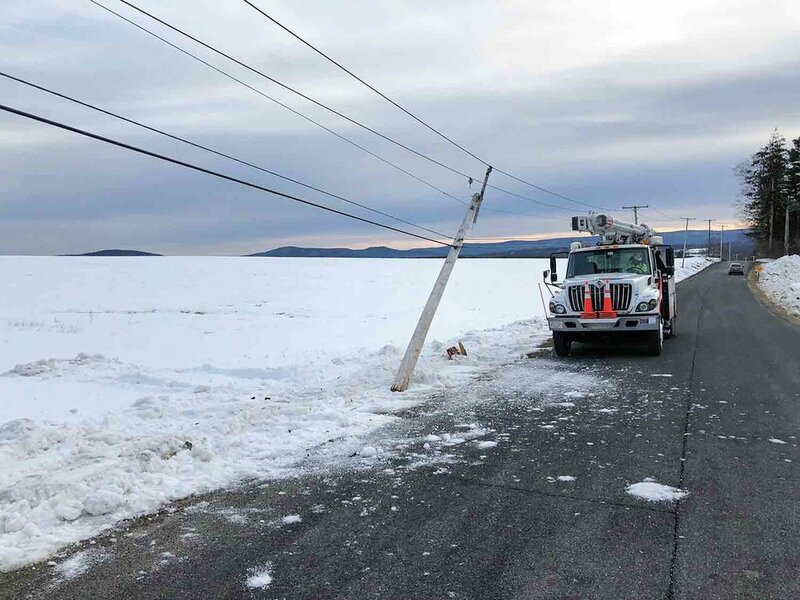 The crew waited until National Grid arrived to replace the downed pole and then reattached the fiber optic cable. Throughout the incident service was maintained to the Fiber Connect subscribers along Baldwin Hill East. Incident fully resolved by mid-day.